A local landmark is The Stag's Head a thatched roofed public house which dates back to 1640 is on the corner of Chestnut Square. Chedham's Yard is along Church Walk which leads off Chestnut Square, in the village of Wellesbourne, Warwickshire at CV35 9QT?. By train: The nearest train stations are Stratford Upon Avon and Warwick which are both approximately 6 miles away. There is no parking at the site or along Church Walk. Cars, coaches and mini-buses should be parked in the Loxley Close alongside the sports field spur and approximately 300m south of the Stag’s Head public House, near to the Coop store. There are Car Park signs on the Ettington Road. 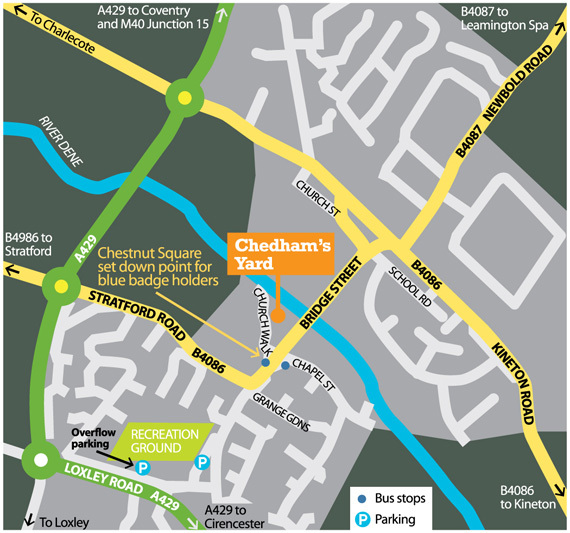 Blue badge holders should be dropped off in Chestnut Square which is about 100m from the main entrance. The car should then be parked in the main car parking area is off the Ettington Road - turn into Loxley Close to the Co-op supermarket, then immediately right into the spur road, adjacent to the sports field. This is 300m from the entrance and about a 5 minute walk to the site.